Harriet Backus writes about her life as an assayer's wife and true pioneer of the West with heart-felt emotion and vivid detail. Sharing her amusing and often challenging experiences as a new bride in the high San Juan Mountains where the Tomboy Mine operated above Telluride, Colorado, she paints a poignant picture of the people, and the life centered around silver mining where most of the book takes place. 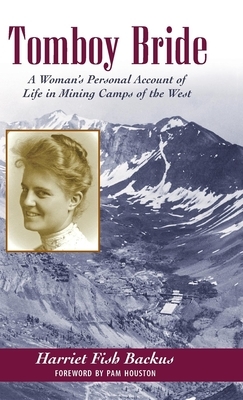 It is a skillfully written account from a women's perspective in a rough and tumble mining town that has made this book a classic for women's studies. Harriet's life followed her husband George's career which took them many places beyond the San Juan Mountains including the rugged coast of British Columbia, and the mountainous mining town of Elk City, Idaho and back to Colorado's Leadville. Although both Hattie and George were from the San Francisco bay area where they eventually retired, her heart never quite left the rugged mountain trails of the high San Juans of Colorado. Harriet Fish grew up in the San Francisco bay area, and taught school until the San Francisco earthquake of 1906 closed the schools. She then worked for the Telegraph Company for two years. Her sweetheart of high school days, George Backus, a graduate of the University of California School of Mines, found work as an assayer in Telluride, Colorado. Against her family's wishes, she traveled to Denver since her fiancee could not return to California for the wedding. Hattie, as she was called remained happily at her husband's side his entire life although she was fearlessly independent and strong on her own. While George was introverted and competent, Hattie Fish Backus overshadowed him as an extroverted, smart, controlling, opinionated and very devoted wife. She wrote "Tomboy Bride "in the early 1940s, but it was repeatedly rejected by publishers. Being independent and ahead of her time, she self-published the book. In 1977, Pruett Publishing of Boulder, Colorado took over publication, and over 75,000 copies of the book have been sold since that time.